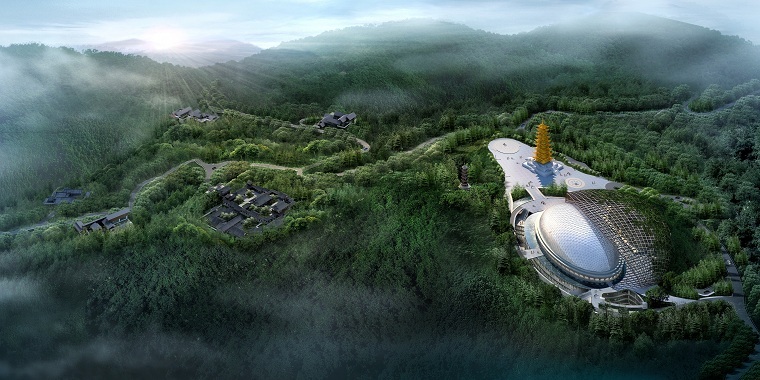 Located in the west peak of Niushou mountain, Usnisa Palace belongs to the pit construction, which is 220 meters long, 160 meters wide and 89.3 meters high. The single building area covers about 136,000 square meters. It is based on different supporting themes. According to different supporting contents, the outside space is divided into two parts: the large dome and the small dome, meaning external supporting and internal supporting. The inside space consist of nine floors, with 6 floors underground and 3 floors on the ground. The 6 underground floors is made up of the Usnisa Hall and Usnisa Worshipping Palace. The large and small dome of Usnisa Palace symbolize external supporting and internal supporting. With the length of 120 meters, the large dome is like the kasaya (Buddha's robe) , and covers on the small dome, standing for kasaya protecting the holy śarīra( relics). This is the small dome. The overall shape is like bun of the Buddha, while the upper part alone is like two palms putting together devoutly, indicating Buddhism followers’support for the Buddha. The base of the small dome is Buddha's lotus seat, composed of 56 apsaras bodhi doors and 56 cloud pattern columns. 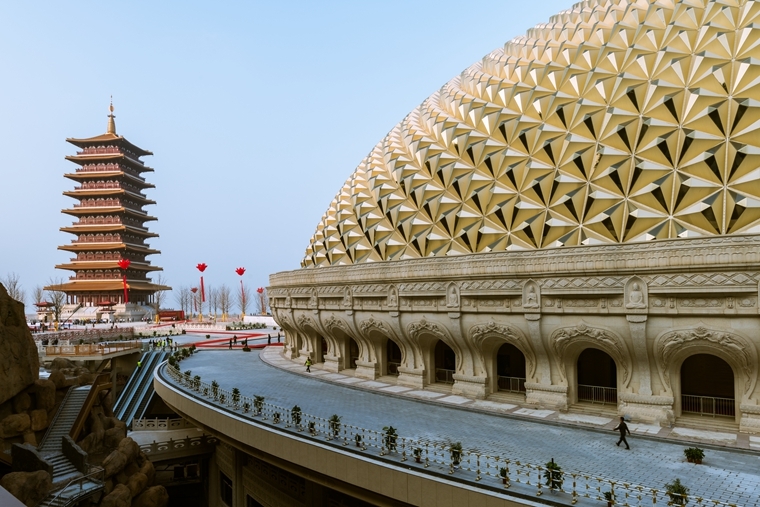 The whole building presents the holy image of Buddhist pearl in Lotus seat. Chan State and Fortune Sea: In the center is a lying cooper statue of Sakyamuni, 9 m long, with the surface decorated with imitated white marble. It reflects the Nirvana state of Sakyamuni. Chan Interest Garden: With landscape in space as core and Zen Buddhism paintings as well as stories as theme, interest and state of Chan in nature and life is reflected. 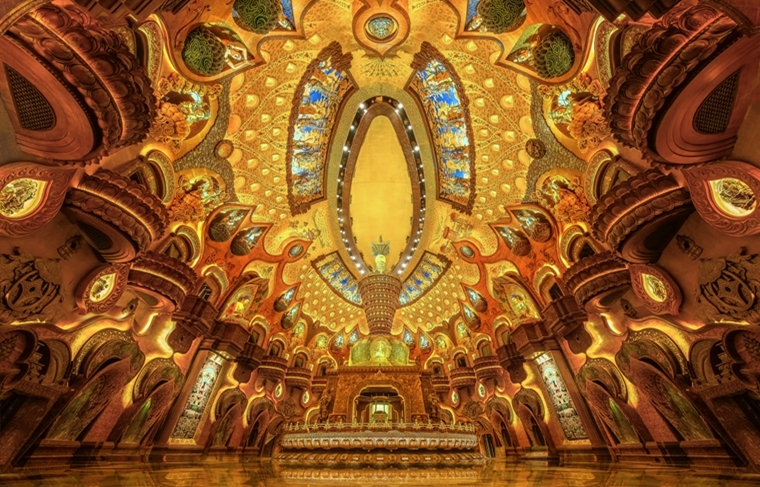 The main color of Thousand-Buddha Hall is red, yellow and dark gold, and the plane is elliptic. 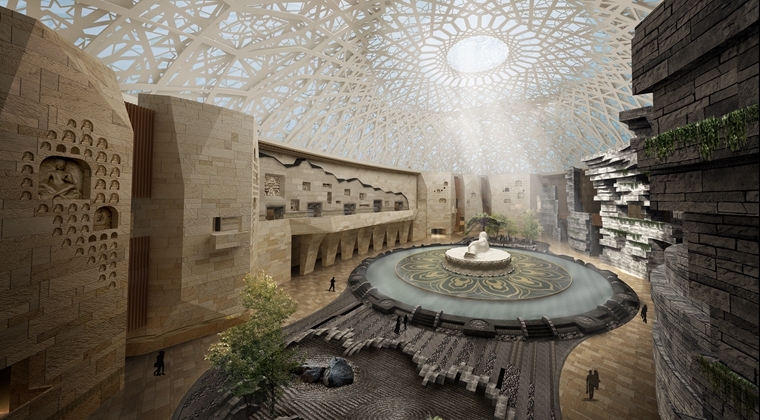 The whole space is in a dome shape, consisting of 3 floors, with the total height of 28 meters. On its external circle is Ten Thousand-Buddha Corridor. The layout of the Thousand-Buddha Hall is arranged according to five regional Buddhas of the Avatamsaka realm. The Great Stupa of Usnisa which represents the Vajradhatu Mahāvairocana is set as the center. Together with Four Paramita Bodhisattvas，Four Regional Buddhas, 16 Bodhisattvas for Approach to Buddhist Wisdom，the Four Guiding Bodhisattvas and Eight Supporting Bodhisattvas，the scene of Fourth Buddhist Ceremony for Supporting of Vajrs-dhatu Mandala is displayed. The core of Thousand-Buddha Hall is the Great Stupa of Usnisa for enshrining Usnisa, which is 21.8 m high. With reference to central cave pillar of Mogao Grottoes in Dunhuang and King Asoka Pagoda in the Giant Bao’en Temple, design of this stupa originates from the overhanging Sumeru, symbolizing clean and solemn Avatamsaka realm( the Buddhist world). Ten Thousand-Buddha Corridor is composed of the underground third, fourth and fifth floor. 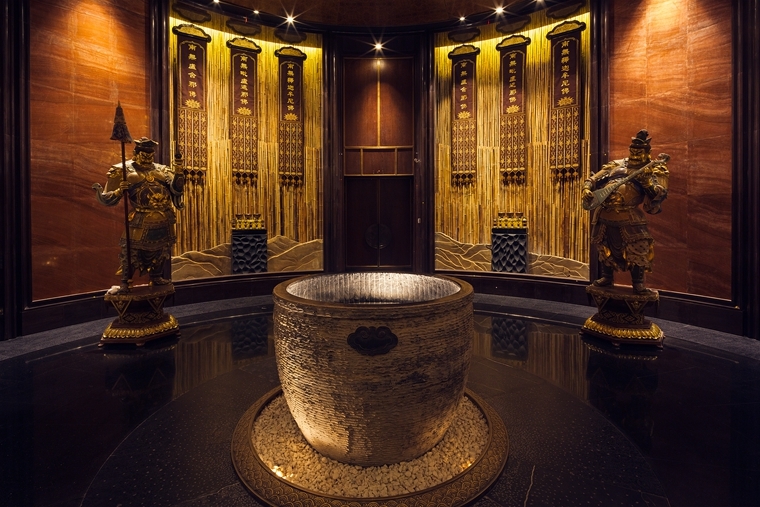 The third floor presents Chinese Buddhist culture, with 2 Buddhist scripture corridor and 16 meticulous paintings. The fourth floor shows Indian Buddhist culture, thus, seven lacquer paintings that shows Indian Buddhist doctrines and 20 flying apsaras are placed in the round corridor. The fifth floor is related to Buddha’s life story and relic culture, including the multimedia video that presents Buddhism and relic culture, 10 porcelain plate paintings, eight stupas, and other exhibitions. Usnisa Worshipping Palace is located 44 m underground, in which the central area is called Palace Hall. Usnisa will be enshrined here for a long time. The hall is mainly in dark color, making it solemn and mysterious. 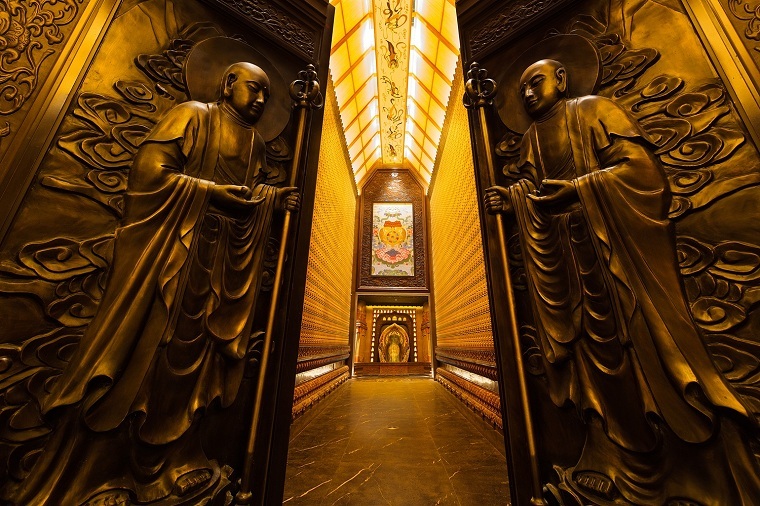 This corridor is 66 meters long, symbolizing six paramitas of the bodhisattva including keeping the commandments, charity, patience under insult, zeal and progress, meditation, and wisdom.